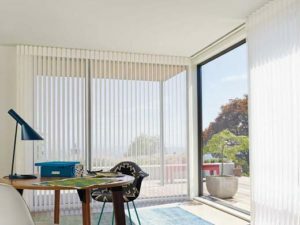 If you’re looking for a solution for covering a large window or sliding glass door, you might want to consider Hunter Douglas Luminette® Privacy Sheers. At Treasure Coast Window Fashions serving West Palm Beach, our trained consultants will be happy to walk you through the benefits of this great product. Sliding glass doors and French doors help you bring the outdoors inside by creating a seamless flow. They also offer all-year-round views of your garden landscape and panoramic views beyond. So don’t cover them up with heavy drapes, bulky shutters, or loud vinyl verticals. Go with the soft solution! With all the hard surfaces in your home already, including kitchen appliances, hardwood floors and more, introducing these soft sheers to your décor will create the perfect balance. This unique vertical treatment resembles traditional sheer draperies but allows you to rotate the vertical fabric vanes like a traditional vertical blind. The Luminette vanes rotate to provide 180° of light control and are available in both translucent and room-darkening fabrics and 66 colorways. Plus, you can find coordinating colors and fabrics that can be combined with other Hunter Douglas products for a whole house look. As is true with all textiles, Luminette fabric is subject to the occasional wrinkle or crease. Please take a moment to view the attached video, which demonstrates the quick and easy steps you can take to return this vertical sheer to its original pristine condition. Why Hunter Douglas Window Fashions? Treasure Coast Window Fashions provides more than just the finest window coverings. Our owners are involved in every project from start to finish to ensure your window covering project exceeds your expectations. We’re proud to serve the greater West Palm Beach area.